Descent by Ken MacLeod book review . Blokes are rubbish. They can’t multitask, can’t express emotions in any coherent fashion, and do bad things out of jealousy, fecklessness and sheer selfishness. Most of all, blokes are lazy. Why else would they let the likes of Tony Parsons and Nick Hornby define their collective nature within what Ken MacLeod, on his blog, dubs “bloke-lit”? Not that the Kenster – sorry, blokey moment there, been watching Top Gear – appears to be too critical of Parsons and Hornby. Rather, he seems drawn to the idea of “a first-person, confessional tale of an ordinary guy who behaves with typical male insensitivity and self-absorption until at least one exasperated woman-in-his-life knocks him about the head with some home truths”. So much so that he’s invented a new subgenre, “near-future bloke-lit” for his latest novel, a book written with a “feel and tone” that’s “about as unskiffy as I could make it”, despite it concerning UFOs. Initially, this doesn’t sound too promising. Indeed, it sounds suspiciously tricksy, a case perhaps of a writer setting himself a writing challenge for the sake of it? Well, yes and no. Yes, in that MacLeod’s recent novels have often seemed like exercises in isolating a specific SF trope and then mucking about with it. Think of the way The Restoration Game (2010) plays with the idea of our reality being a construct, a virtual space. In the case of Descent , MacLeod’s main SF subject is alien abductions. This is a novel where the life of his protagonist Ryan (if that’s not overstating things - Ryan’s mostly too rubbish to be proactive) is shaped by a flying saucer encounter as a teenager, even after he’s grown up to be a science journalist. It’s an approach that could be seen as back-to-SF-basics reductive, except that’s not how Descent comes across. Forget the notion of this being a writing challenge conducted for the sake of it; more accurate is to view MacLeod’s self-imposed writing challenge as one set for the fun of it. And Descent is most certainly fun, in great part because MacLeod turns out to be so good at bloke-lit. The friendship between Ryan and best mate Calum, for example, is carried in conversations that are rich in the kind of joshing thieves’ cant men use lest they come across as being, y’know, a bit girly when they express how they feel. As for MacLeod’s portrayal of the near future, it’s both wonderfully and frighteningly believable. Wonderfully because, in setting his story in an independent Scotland where the “Big Deal” is in full swing, a renewal of society and the economy on broadly social democratic principles, he reminds us that the vulgarities of neo-liberalism won’t last forever. Frighteningly because there’s always another crisis on the horizon, because things may not be quite as they seem, and because things are almost certainly weirder than they appear. Especially for Ryan. Following his alien encounter and a spot of sperm harvesting, he becomes convinced that he’s met a Man in Black and is caught up in a vast conspiracy. (He might be…) Into this already rich brew, MacLeod also weaves Ryan’s doomed romance with the frighteningly focused Gabrielle, an exploration of the idea that humankind might split into two species, and learned musings on how revolutions work. 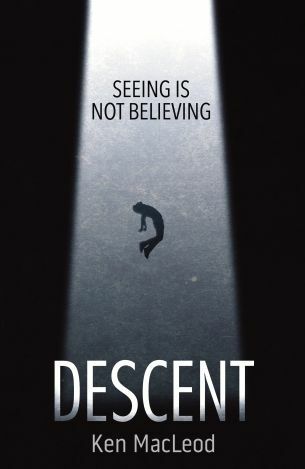 But for all that MacLeod weaves around his central theme of ufology, Descent isn’t a novel of ideas. No, it really is bloke-lit, and in the final analysis it succeeds because the unreliable Ryan’s story – and as he’s a self-serving, even paranoid narrator, you’re constantly uncertain how far to believe his shifting interpretation of events – draws you in. A big-hearted, richly comic and, for all it often plays scenes for laughs, deeply moral and serious novel.